Slideshows presented at the Connect HP-UX Boot Camp by Hewlett Packard Enterprise are considered HPE Intellectual Property. These materials are made available after the show to customers and partners for free use in their current format within their own company only. You may not post them on public websites. There are restrictions on any reuse of the contents of the HPE presentations beyond what is described above. Prior written permission from HPE is required. Oracle is one of the most common ISV stack that is deployed on HP-UX. This session demystifies the support and future roadmap of Oracle on HP-UX post the HPE-Oracle litigation. 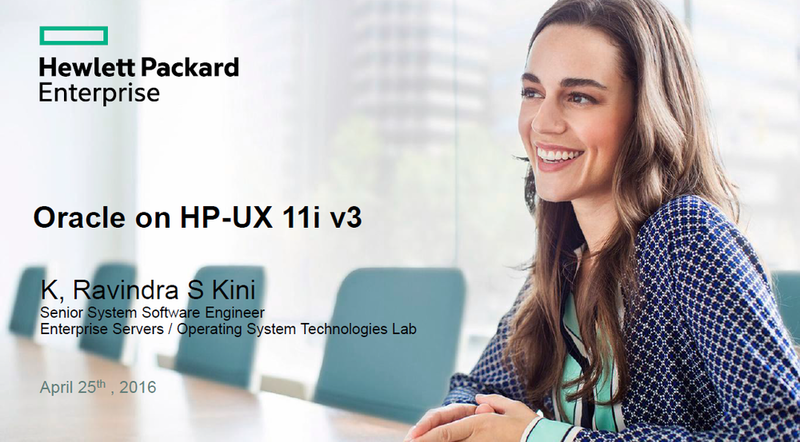 This session also covers the plan and certification needs pf key HP-UX products with Oracle. Do you know EXACTLY how your systems are configured? If one of your systems crashed and had to be rebuilt from scratch, could you reconfigure all of your volume groups, logical volumes and file systems? What about users and groups? Or cron jobs? Or a thousand other details that comprise each of your systems? These are just a few of the items that system configuration tools like CFG2HTML and Sysinfo can answer for you in a pinch. I will go over several tools, including CFG2HTML and Sysinfo, to show you what operating systems they run on, how to run them, and the information they provide. I will also show how you can script them so that they run automatically and then copy them to another server and set up a web page so that they are available from anywhere within your corporate Intranet. I will also cover cases in which I have used system configuration information to assist customers in recovering their systems. HPEFS will provide the pathway to extending a customer's existing IT infrastructure to allow maximum utilization of current IT infrastructure and provide a confident, reliable solution to ensure their existing IT can remain in place for the foreseeable future. Disposal of existing IT equipment allowing for environment considerations and indemnification for the customer. Customer's will walk away with a better understanding of their options from HPE on how to continue to use existing hardware, acquire additional flexibility and reduce costs for their IT infrastructure.